Blue Heron Restaurant & Tavern | Duncans Mills, CA 95430. Camping, Restaurants, Bars, Shops, Antiques, Art, Wine, Recreation. 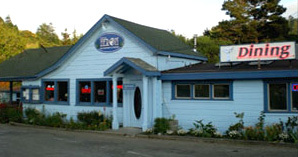 Built in the late 1800’s, the Blue Heron is a beautiful, rustic restored tavern. The redwood finished dining room features beef, chicken, the seafood we’re famous for and vegetarian dishes. In the tavern, the full menu is served including hearty pub food, beer, local wines and liquor. In the summer barbecued oysters by ‘What the Shuck’ are served on the outdoor garden patio on Sundays, along with live music. We are a favorite restaurant in Sonoma for folks visiting the Russian River area.